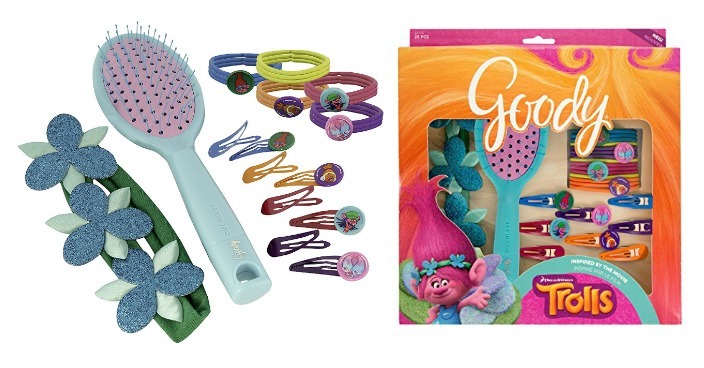 Goody Trolls Hair Accessory Gift Pack Just $4! Down From $25! You are here: Home / Great Deals / Goody Trolls Hair Accessory Gift Pack Just $4! Down From $25! Amazon has this Goody Trolls Hair Accessory Gift Pack on sale for $4 (Reg. $25)! Plus you can get FREE shipping on orders over $49 or if you are an Amazon Prime Member and this toy is an Add-on so you must check out with at least $25 in your cart. Goody makes fun hair accessories designed just for girls! From soft hair tie elastics to stylish headbands to hold back bangs and loose hair, Goody ensures her style stays put while feeling great. With hair accessories inspired by the DreamWorks movie Trolls, she can put her hair in the air for a hair-rific day, any day.